Discover our chefs' recipes for Easter. Lamb, chocolate and spring vegetables all feature prominently! 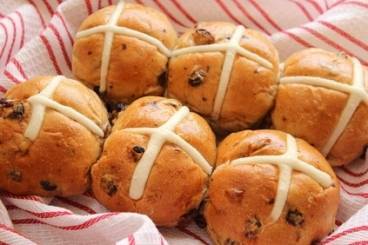 We also have our very own hot cross bun recipe. Served as a classic Easter treat, these traditional spiced, sticky glazed buns are made with fruit and topped with pastry crosses. 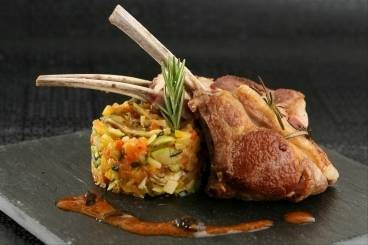 Rack of lamb cooked with garlic and rosemary served with courgettes, spring onions, fennel, broad beans and a red pepper sauce. A delicious lamb dish cooked with a herb crust and served with pommes maxin, green beans and a red wine jus. Serve after dinner or at afternoon tea. A delicious chocolate treat! Rich, melt-in-the mouth chocolate truffles made with a mixture of milk and dark chocolate and dusted with cocoa powder. Made with fruit, spices and a marzipan topping, Simnel cake is traditionally eaten at Easter. Make your own coloured marzipan and shape to for marbled Easter eggs to use as cake or biscuit decorations over the Easter period. These delicious spiced buns are packed with dried fruits and are traditionally served around Easter. Tender lamb studded with garlic,oregano and lemon zest, cooked until falling off the bone. Potatoes and rosemary cooked in pan juices - a great easter showstopper. Combining the flavours of Prawns, creamy garlic dip and salty sour capers.